Grand Duchess Elizabeth Fyodorovna of Russia (Елизавета Фёдоровна), née Her Grand Ducal Highness Princess Elizabeth Alexandra Luise Alice of Hesse and by Rhine (February 24, 1864 – July 18, 1918), was the wife of Grand Duke Sergei Alexandrovich of Russia, the fifth son of Emperor Alexander II of Russia and Maria Alexandrovna (née Princess Marie of Hesse-Darmstadt). After the assassination of her husband, she went on to found a convent dedicated to ministering to the poor. She was later martyred by the Bolsheviks, and more recently she has been glorified as a new martyr. Elizabeth was the second child and daughter of Grand Duke Louis IV of Hesse and Princess Alice of the United Kingdom, a daughter of Queen Victoria. She was also the elder sister of Alexandra Fyodorovna, the last empress of Russia. Elizabeth was affectionately called Ella by her family. 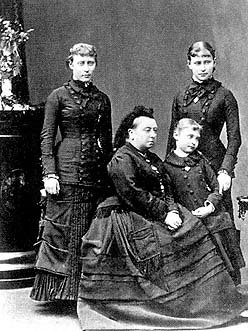 In the winter of 1878, diphtheria swept through the Hesse household, killing both Elizabeth's youngest sister and her mother, Princess Alice. Elizabeth was not in Hesse at the time and was the only member of the family not affected by this outbreak. Orphaned at the age of 14, she was partly brought up by her grandmother, Queen Victoria. Having had an English mother and then living in England, she and her sister Alexandra were most comfortable speaking English, and most of the letters exchanged between Tsar Nicholas, Tsaritsa Alexandra, and the Grand Duchess Elizabeth are written in English. Elizabeth once caught the eye of her elder cousin William II, but she flatly rejected him and instead married Grand Duke Sergei of Russia in June 1884. She and her husband, Grand Duke Sergei, adopted and raised the Grand Duke Dmitri Pavlovitch and his sister Grand Duchess Maria Pavlovna after their mother died during Dmitri's birth. The grand duchess, of her own volition decided to unite herself to the Orthodox Church. When she made the announcement to her spouse, according to the account of one of the servants, tears involuntarily poured from his eyes. The Emperor Alexander III himself was deeply touched by her decision. Her husband blessed her after Holy Chrismation with a precious icon of the Savior, "Not Made by Hands" (a copy of the miraculous icon in the Chapel of the Savior), which she treasured greatly throughout the remaining course of her life. Having been joined to the Faith in this manner, and thereby to all that makes up the soul of a Russian, the grand duchess could now with every right say to her spouse in the words of the Moabite Ruth, "Your people have become my people, and your God my God" (Ruth 1:16). Like many converts to the Orthodox Faith, the Grand Duchess had to deal with the negative reaction of her family. The Grand Duchess was received by Chrismation on Lazarus Saturday, 1891, and then during that Holy Week she was able to receive Holy Communion with her husband for the first time. Tragically, Elizabeth's husband was assassinated with a bomb on February 18, 1905, while on duty in the Kremlin, by Social-Revolutionary (SR) Ivan Kalyayev. "Grand Duchess Elisabeth heard the explosion and felt the shock; she rushed outside and saw the dismembered body of her husband strewn around the square. She knelt in the snow and helped collect the remains and, almost incredibly found the strength to arrange for the transportation to a hospital of the grand duke's coachman, who had been severly wounded. Visiting the dying man later, she told him that the grand duke was well and safe, and had in fact sent her, enabling the man to die peacefully." "The lofty spirit with which she took the tragedy astounded everyone: she had the moral strength even to visit in prison her husband's assassin, Kaliaev, hoping to soften his heart, with her Christian forgiveness. 'Who are you?' he asked upon meeting her. 'I am his widow,' she replied, 'why did you kill him?' 'I did not want to kill you,' he said. 'I saw him several times before when I had the bomb with me, but you were with him and I could not bring myself to touch him.' 'You did not understand that by killing him you were killing me,' she said. Then she began to talk of the horror of his crime before God. The Gospel was in her hands and she begged the criminal to read it and left it in his cell. Leaving the prison, the Grand Duchess said: 'My attempt was unsuccessful, but, who knows, perhaps at the last minute he will understand his sin and repent.' "
Afterwards, Grand Duchess Elizabeth became a nun, giving away her jewelry and selling her most luxurious possessions. With the proceeds she opened the Martha and Mary Home in Moscow to foster the prayer and charity of devout women. For many years she helped the poor and orphans in this Moscow home. Here there arose a new vision of a diaconate for women, one that combined intercession and action in the heart of a disordered world. In April 1909 Elizabeth and seventeen women were dedicated as Sisters of Love and Mercy. Their work flourished: soon they opened a hospital and a variety of other philanthropic ventures arose. In 1918, the Communist government exiled her to Yekaterinburg and then to Alapaevsk, where she was violently killed by the local Bolsheviks on July 18, 1918, along with Grand Duke Sergei Mikhailovich Romanov; the Princes Ioann Konstantinovich, Konstantin Konstantinovich, Igor Konstantinovich, and Vladimir Pavlovich Paley; Grand Duke Sergei's secretary, Fyodor Remez; and Nun Barbara Yakovleva, a sister from the Grand Duchess Elizabeth's convent who had refused to leave her Abbess. They were herded into the forest, pushed into an abandoned mineshaft, into which grenades were then hurled. An observer heard them singing Church hymns as they were pushed into the mineshaft. After the Bolsheviks left, he could still hear singing for some time. The last thing Elizabeth did as she lay dying in the mineshaft was to bandage the wounds of Prince Ioann with her handkerchief. Later the White Army briefly recaptured this area, and her relics were recovered and the account of the person who witnessed it recorded. Her relics were first taken by the White Army to Beijing and placed in the Church of St. Seraphim of Sarov, and then they were taken to Jerusalem and placed in the Church of St. Mary Magdalene, which she and her husband had helped to build. She was glorified by the Russian Orthodox Church Outside of Russia in 1981, and by the Russian Orthodox Church as a whole in 1992 as New-Martyr Elizabeth. Her principal shrine in Russia is the Ss. Mary and Martha Convent she founded in Moscow. Most of her relics remain in Gethsemane, but in in 2004, a reliquary containing portions of her relics, as well as those of the Nun-Martyr Barbara, were taken to Russia, and visited 61 dioceses of the Russia and the Commonwealth of Independent States, and were venerated by over 10 million people. A portion of these relics were given to the Ss. Mary and Martha Convent, and remain there. She is also one of the 10 20th-century martyrs from across the world who are depicted in statues above the Great West Door of Westminster Abbey in London. Her feast day is celebrated on July 5 (she was martyred on July 18, according to the New Calendar, which was July 5 on the Old Calendar). She is also commemorated on the feast of the New Martyrs and Confessors of Russia, celebrated on the Sunday nearest to January 25, which was the date of the martyrdom of Metropolitan Vladimir of Kiev, the first of the new martyrs. And with the martyr Barbara thou didst find everlasting joy. Therefore, pray ye in behalf of our souls. ↑ Ludmila Koehler, Saint Elisabeth the New Martyr, (New York: The Orthodox Palestine Society, USA, 1988), p. 12. ↑ Metropolitan Anastassy, Life of the Holy New Martyr Grand Duchess Elizabeth, Orthodox Life, vol. 31, no. 5 (Sept.-Oct., 1981), pp. 3-14. ↑ Ludmila Koehler, Saint Elisabeth the New Martyr, (New York: The Orthodox Palestine Society, USA, 1988), p. 25. ↑ Ludmila Koehler, Saint Elisabeth the New Martyr, (New York: The Orthodox Palestine Society, USA, 1988), p. 26. ↑ Ludmila Koehler, Saint Elisabeth the New Martyr, (New York: The Orthodox Palestine Society, USA, 1988), p. 30. This page was last edited on June 28, 2014, at 15:18. This page has been accessed 107,178 times.